Ready your camera and capture Damnoen Saduak Floating Market's intricate food and souvenir stalls! 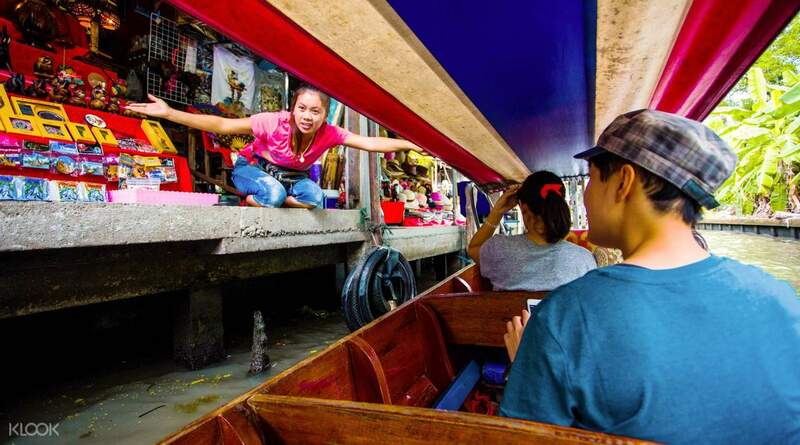 Enjoy the unique experience of shopping for local food and other Thai favorites on a boat! Score quality products and exciting souvenirs without breaking the bank! Go souvenir shopping at Thailand's best markets! 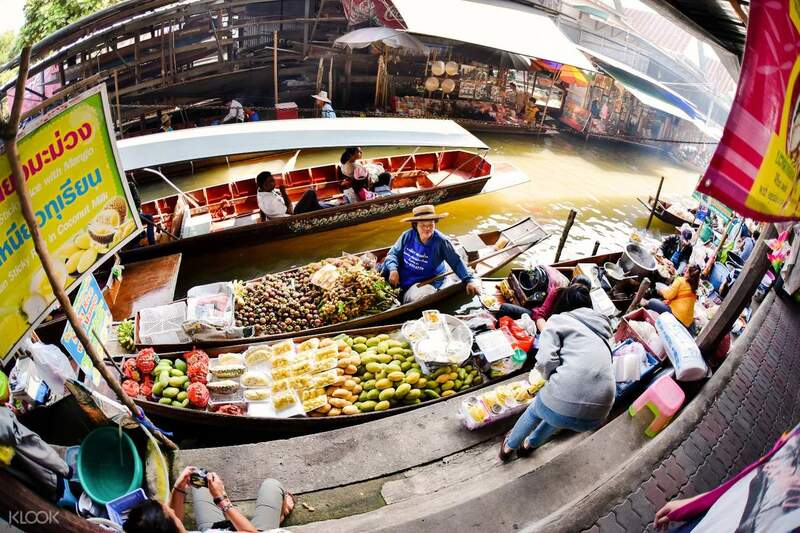 Visit Damnoen Saduak Floating Market and Chatuchak Weekend Market, two of the most popular souvenir spots known for their cheap quality products. Start your trip with a visit to the Damnoen Saduak Floating Market, a canal system made appealing by the vibrant colors of the local stalls. Experience shopping on a boat and get to interact with the friendly local vendors. Buy fresh fruits and vegetables, or order authentic local dishes at one of the food stalls. Continue the shopping adventure later on at Chatuchak Weekend Market. There, you'll find ridiculously cheap quality items and lots of other products. You can haggle the price or not, but more importantly, you can shop 'till you drop as this trip allows customers to take their own time. Just make sure that you know your way back to your hotel! Book now for a half day escapade! The shopping adventure start at Thailand's extraordinary market - Damnoen Saduak Floating Market! 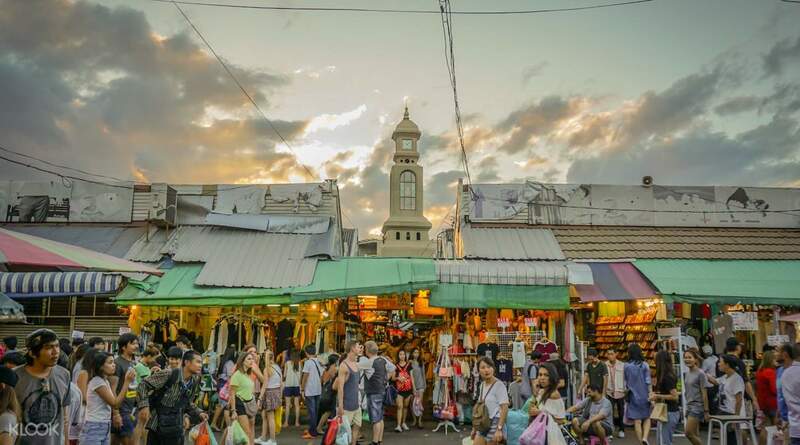 Brace yourself for the biggest crowd you'll ever see, as Chatuchak welcomes an average of 200,000 buyers daily! 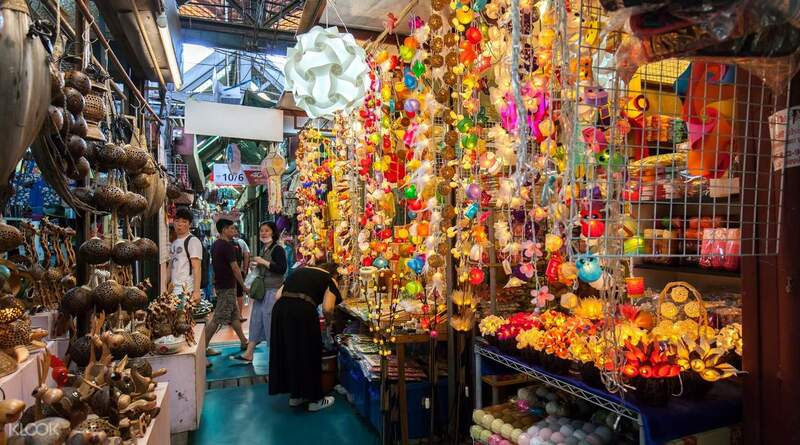 Shop 'till you drop at Chatuchak Weekend Market, home to over 8,000 market stalls! The trip was on time and the agents office was easy to find. The package was good of going to the floating market first and then to the weekend market. it would have been good if they had stopped for few mins in the maeklong train market for few mins. only minus was that, we found the boat operator in the floating market to be money making guy. he stopped in shops where he knew ppl well so he would make a concussion. anyways the host asked us not to buy anything in the floating market, because prices are bomb there. thanks to the host for creating us a memory in our life. The trip was on time and the agents office was easy to find. The package was good of going to the floating market first and then to the weekend market. it would have been good if they had stopped for few mins in the maeklong train market for few mins. only minus was that, we found the boat operator in the floating market to be money making guy. he stopped in shops where he knew ppl well so he would make a concussion. anyways the host asked us not to buy anything in the floating market, because prices are bomb there. thanks to the host for creating us a memory in our life. We had a great time going through the floating market. The chicken satay was delectable as well as the mango sticky rice. All in all, a fun experience! We had a great time going through the floating market. The chicken satay was delectable as well as the mango sticky rice. All in all, a fun experience! It's nice that you get to floating market and Chatuchak Market hassle free as Grabs are pretty pricey. It's nice that you get to floating market and Chatuchak Market hassle free as Grabs are pretty pricey. unique experience. a must try when you are in bangkok. 2 hours from the city. all went well. thanks klook! unique experience. a must try when you are in bangkok. 2 hours from the city. all went well. thanks klook! We had fun. The driver (i forgot his name) was really nice and he took us to another spot after the floating market. The trip was on time and we didn’t have any problem at all. The van was comfy also. We had fun. The driver (i forgot his name) was really nice and he took us to another spot after the floating market. The trip was on time and we didn’t have any problem at all. The van was comfy also. We arrived at the office before 7am and it was quite early, we needed to wait outside as the K travel office had not opened yet. The staff was nice, the journey to the floating market quite far from the city center, took about an hour to get to the floating market and another hour to get back. Remember to have breakfast as they just dropped us at the food court after the floating tour, and the food is good but quite expensive, around 150 bath for a bowl of noodles (photo attached). Eating on boat is not so convenient! We arrived at the office before 7am and it was quite early, we needed to wait outside as the K travel office had not opened yet. The staff was nice, the journey to the floating market quite far from the city center, took about an hour to get to the floating market and another hour to get back. Remember to have breakfast as they just dropped us at the food court after the floating tour, and the food is good but quite expensive, around 150 bath for a bowl of noodles (photo attached). Eating on boat is not so convenient! Easy to find the meeting point but the agent was late so we had to wait for a lil while. A fun experience but I don’t think i will go again. Journey to the market takes an hour. Do get some light snacks on the go. Easy to find the meeting point but the agent was late so we had to wait for a lil while. A fun experience but I don’t think i will go again. Journey to the market takes an hour. Do get some light snacks on the go. love the service provided by the AK travel agency. the agency will tell u the do’s & don’t at the floating marketing which actually “up” their trust game to the next level. fluent in Chinese, great for chinese traveler. Driver was great, despite the weather condition, the tour at chatuchak was ealier than expected which allows more shopping time. love the service provided by the AK travel agency. the agency will tell u the do’s & don’t at the floating marketing which actually “up” their trust game to the next level. fluent in Chinese, great for chinese traveler. Driver was great, despite the weather condition, the tour at chatuchak was ealier than expected which allows more shopping time. The meet-up location is very convenient. Located near to 7-11 convenient store. So, you can grab some bites before depart. Driver was friendly to passangers. Overall, we had good experience with the trip. The meet-up location is very convenient. Located near to 7-11 convenient store. So, you can grab some bites before depart. Driver was friendly to passangers. Overall, we had good experience with the trip.